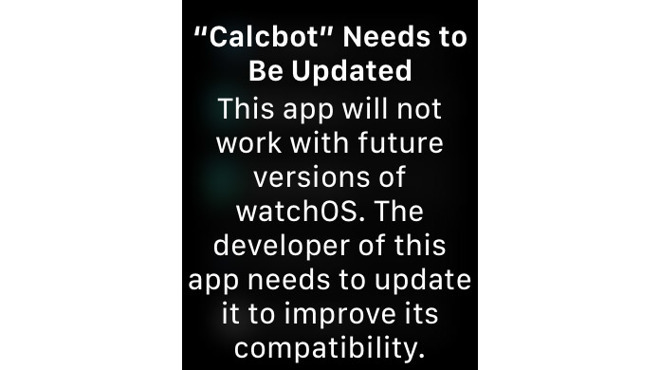 In the latest watchOS beta, attempting to open legacy watchOS 1 apps triggers a message notifying users that legacy titles will soon be incompatible with Apple's wearables platform. It also includes some light prodding aimed at developers who want to continue to market their native Watch wares on the App Store. "The developer of this app needs to update it to improve its compatibility," the warning reads. Tapping the "OK" button allows the app to open and run normally, suggesting watchOS 4.3.1 is fully compatible with older Watch software. The message is similar to a notification in iOS 10 that informed users of a pending shift away from 32-bit apps in favor of 64-bit apps. Then, like now, the upcoming move will come as no surprise to developers, who have been aware of the policy for months. In November, Apple informed developers that it will stop accepting watchOS 1 app submissions in 2018. Since April 1, app makers have been required to use the watchOS 2 software development kit or later to build updates to existing apps, while new apps must be coded with watchOS 4 SDK or later. Beyond the developer announcement, Apple has not specified a formal end of life for titles built with watchOS 1. As noted by 9to5Mac, the warning message included with watchOS 4.3.1 beta suggests Apple might drop support with watchOS 5, which is expected for unveiling at WWDC 2018 in June. Apple did much the same with 32-bit apps on iOS, notifying users of the pending change in iOS 10 before instituting the policy with iOS 11. The change is a long time coming for Apple's wearable OS, which started life as a fledgling platform that leaned heavily on iPhone to function. Apple granted developer access to Apple Watch hardware with watchOS 2 in 2015, later mandating all third-party software use the SDK to create native apps in 2016. Despite a steadily increasing user base and efforts to make Apple Watch a true standalone device, major app makers have abandoned development of native apps for the platform. Most recently, Instagram this month killed off its app rather than rebuild it with the watchOS 4 SDK.